This roof nailer from Milwaukee comes out with some main accessories including Safety Glasses, 2 oz. oil, 4mm Hex Wrench and carrying case.The most prominent features which I experienced with this roof nailer include tool-free depth, light weight, easy loading mechanism and self cleaning. The tool-free depth restricts you to drive nail of any size from 3/4 to 1-3/4 inch of 0.120 inch diameter, within the driving area so there is no chance of over-driving and hence the nail fits well within the area. 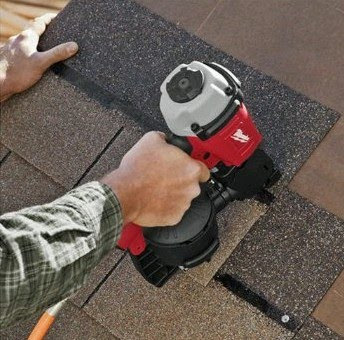 The nailer has magnesium housing which is light weight to reduce chances of structural damage by mishandling and also the rubber guards help to protect it from any kind of damage if it falls. 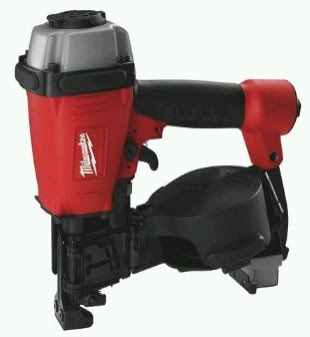 Easy loading mechanism is hardly found in other nailers. Just open the feed flip and the coil comes easily without turning the nailer. The selectable trigger setting also allows you to take control of the speed mode by turning the actuator selector to sequential or contact actuation mode. One more feature of this nailer gun is the maximum magazine capacity in which you can fill upto 120 nails at a time so you don’t need to re-fill frequently and the presence of magnet causes fast and accurate loading. Other advanced features of this nailer gun are self cleaning and adjustable air deflector. Both of these features increases its life as self cleaning air filters out dust particles from entering into the gun and the adjustable air deflector with muffler minimizes any kind of interference and cancels the noise effect. One more important feature is that it requires less pressure as compared to other nailer gund like the most common Hitachi nailer. The pressure limits are 70-120 PSI with air consumption of .08 cu. ft./cycle at 100 PSI. This pressure is more than enough for nailing asphalt/fiberglass shingles, waterproof tar paper, roofing felt, fire wall (exterior gypsum board), house wrap, cement board, insulation board, metal drip edges, siding, vapor barrier, upholstery trim panels. So you don’t need to apply extra pressure by attaching pressure pumps and will also save you some money. Nail guns are really fun but they’re pretty dangerous. Don’t ever have nail gun wars. It’s not the safest thing ever. They work really great for roofing though. Just use them for roofing.